Hello Everyone! Happy Monday! Wow, I know I should be worried about the warm weather we are having on the first day of February but I can’t help but smile every time I have gone outside today. I know winter is coming for real soon so I will cherish this warm sunshine. Today is the start of Black History Month and I am so excited that due to the ‘leap’ we get an extra day (29 instead of 28)! So one extra day to explore more in Black History. Of course we have the whole year, but this time of year, there are often more special events to attend so it’s quite fun. 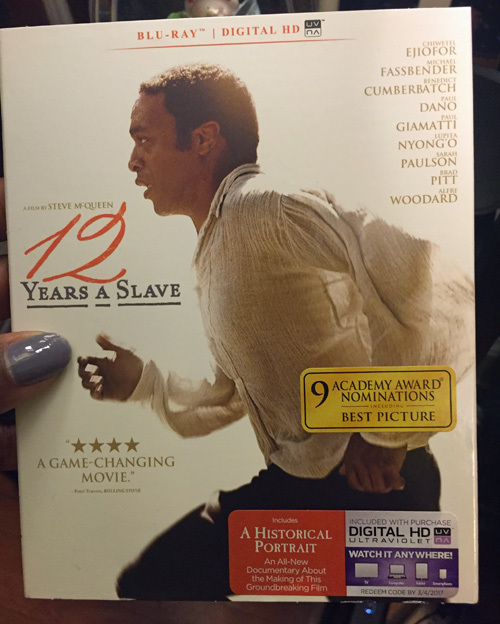 I kicked off my discoveries on Saturday and watched, “12 Years a Slave“, a historical drama adaptation of an 1853 slave narrative memoir (12 Years a Slave) written by Solomon Northup. Steve McQueen, an English film director, producer, screenwriter, and video artist directed this 2013 film, 12 Years a Slave, a historical drama adaptation of an 1853 slave narrative memoir. He he won an Academy Award, BAFTA Award for Best Film, and Golden Globe Award or Best Motion Picture – Drama, as a producer, and he also received the award for best director from the New York Film Critics Circle. McQueen is the first black filmmaker to win an Academy Award for Best Picture. The movie was so powerful. I just knew going into it that I was going to be moved deeply. The idea of slavery is so difficult to process but then to add the fact that Solomon was born and lived free for 30 years before this happened to him. How does one even begin to comprehend what he must have felt? I mean really? The locations they shot the movie brought you right into the story. The casting was spot on and I couldn’t take my eyes off it despite the difficult content. Chiwetel Ejiofor’s depiction as Solomon Northup was spot on. He was perfect for the role and you could see him transform infront of your eyes as he immersed himself into his potrayal. Some scenes you knew everything simply from looking at his eyes. Benedict Cumberbach portrayed one of Solomon’s master’s and although I am used to him portrayed as a villain like he did in the 2013 Star Trek Into the Darkness, it was easy for me to accept him as the slave master but he was a more complex character. He had a strange fondness for Solomon and the movie allowed you to witness the conflicts he had with owning Solomon and securing his debt. Michael Fassbender portrayed another of Solomon’s slave master and I found myself turning from the screen from time to time while witnessing his brutality. Lupita Nyong’o potrayal of Patsey, a slave that works alongside of Solomon was amazing. In 2013 she won the Academy Award for Best Supporting Actress. Nyong’o is the first Kenyan actress and the first Mexican actress to win an Academy Award. In 2014, she was named The Most Beautiful Woman by People and Women of the Year by Glamour. Brad Pitt who helped to produce the film as well as star in the film as Samuel Bass, the Canadian man that eventually helps Northup to secure his freedom. Alfreda Woodward, as a mistress that resides herself to find comfort in the position she holds. I always enjoy her performances and although brief in this film, she represented another aspect of slavery that must be acknowledged. There were many more actors that gave stellar performances throughout this film. I knew going into this film, I was going to be moved to tears. But one thing I realized once the movie ended is that I finally took a deep breath. I felt like I was holding it in so frequently and my face held no secrets to the sadness and anger I felt while watching this film. I just never understand how people could treat other people this way. But despite my knowledge, I felt this was an important story to add to the many. We must be uncomfortable sometimes to move ourselves to the next space. The amazing fact that although during this time period, there were nearly 100 slave narratives written or dictated only Solomon Northup’s was published. Which makes the case even stronger why it should be a required reading as well as viewing of the film. My message to you is if you haven’t watched it, rent or buy it and watch it then tell someone else. It is important for us all to see. It not just black people because we must all jump into the depths and many dimensions of slavery to set us free today. It is not to be buried or filed away but revisited to remind us what humans are capable of and to establish what we will not allow moving forward for all. If you’ve seen the movie, let me know what you think? I wish for you a great Black History Month.